ZUNDERT, The Netherlands (Sept. 3, 2016)  Imagine a drill designer sketching ideas on paper for a marching band's field formations, then crumpling the paper and tossing it aside for a fresh start. That visual image will become larger than life as a float entry in the Bloemencorso Zundert flower parade on Sunday, September 4. The towering float titled "Fanfare" features trumpeters, trombonists and drummers in a chaotic jumble and will be accompanied by a soundtrack that sounds equally distorted. More than 270,000 dahlia blooms will provide the color for the giant sculpture that measures 62 feet long, 14 feet wide and 29 feet high. The float is being built by volunteers from the Molenstraat neighborhood in Zundert, and is one of 20 float entries that will delight the crowd with a creative twist on a familiar subject. Creative concepts and unique interpretations of ideas are hallmarks of entries in the Bloemencorso Zundert. For this year's float, designers Robin Schijfs and Gijs Martens became intrigued by the idea of crumpled paper. "Every year we try to redefine and experiment," Schijfs said. "This year we limited ourselves to double-sided printed paper for the scale model." 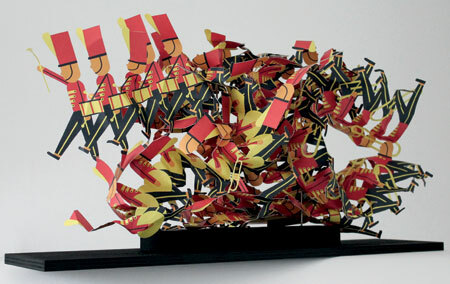 The inspiration for the design was the parade itself, with marching bands being the key ingredient along with the floats. Schijfs said the concept of crumpling came together for this design by chance, and it worked well to show the contrast between uniformity and chaos. "The marching band theme came up year after year but we couldn't figure out what to do with it. Until now. The order of the slick uniforms versus the chaotic 'lump' is a big theme in this design," Schijfs said. In a scene playing out all across town Friday night, volunteers in the Molenstraat tent were working hard to ensure the float is finished in time for the Sunday morning lineup deadline. 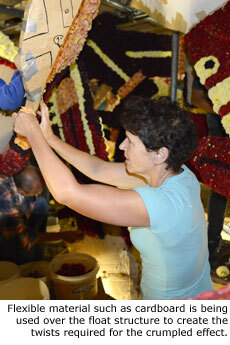 More than 100 volunteers of all ages were carrying out specific duties, whether seated on ground level pressing small nails into individual flower heads or climbing three stories of scaffolding to apply flowers to the highest points of the float. Another cheerful crew was brewing coffee and serving snacks to keep the atmosphere lively and fun. Fortunately, team leaders are confident that a potential flower shortage has been avoided. According to club secretary Johan van der Kloof, wet conditions and cool temperatures in early summer resulted in a lower yield of dahlia blooms. While the supply is sufficient to complete the Molenstraat float, their fundraising effort will take a dip since they won't have extra blooms to sell to other teams and flower parades in nearby towns. Catch a live stream of the 2016 Bloemencorso Zundert on Dutch provincial television at www.omroepbrabant.nl beginning at 1:45 PM in Europe (6:45 AM Central in USA) on Sunday, September 4. "Fanfare" is the fifth of 20 floats in the lineup and will appear within the first half hour. Stay tuned after the parade passes ... following a short break the floats and bands pass the cameras a second time when the judging results are announced. This also gives viewers a chance to see both sides of each float. For more information visit CorsoZundert.nl. Related content on Marching.com: 2009 Bloemencorso Zundert Flower Parade Float Photos and European flower parades display creative genius. Scale model image courtesy of Buurtschap Molenstraat. Photos by Marching.com.